Citroen's long tradition of making big, luxurious saloons was last witnessed with the quirky C6. 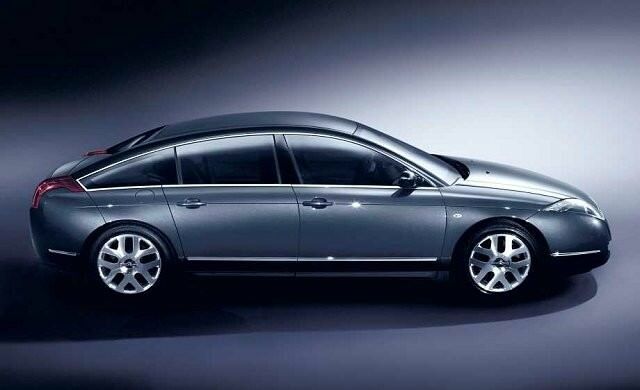 Citroen's long tradition of making big, luxurious saloons was last witnessed with the quirky C6. Avant-garde styling, exceptional comfort and a supple ride quality all appealed, but the lack of a prestigious badge limited its appeal to all but a tiny handful of Francophile buyers. Replacing the square-cut Citroen XM, the C6 was on sale from 2005 to 2012. Citroen is yet, and unlikely ever, to replace this big luxury barge. There's a reason you don't see many C6s on the road; that being the lack of a prestigious badge and the huge focus on the upmarket German saloons. So the C6 is a rare beast, though now it's in the used marketplace it offers a lot of metal for your money. Rather than try and compete with the thrusting German executive saloons the C6 takes its own comfort-orientated route, with supple suspension, lounge-like seats and a smart, extravagant interior. The exterior is similarly striking, too. In its short life the C6 was offered with a variety of engines, these including a 208hp 2.7-litre V6 HDi turbodiesel borrowed from Land Rover, a 173hp 2.2-litre HDi four-cylinder turbodiesel from 2007 and a 215hp 3.0-litre V6 petrol. The V6s both came with a six-speed automatic as standard, the 2.2-litre HDi with a six-speed manual gearbox. Good luck trying to find anything but 2.7 HDi-engined cars in the classifieds, as it took all but the tiniest handful of sales. A 3.0-litre HDi option arrived in 2009, though you'll be lucky to ever find one here given the low sales of all new cars that year. Trim levels consisted of a base model, Lignage and Exclusive, the equipment count in all being high, including things like a head-up display, a speed reactive rear spoiler, dual-zone climate control and an electronic parking brake. Options included front and rear parking sensors (useful given its length), satnav and a Lounge Pack, which added a pair of luxurious seats in the rear - their shape inspired by those in France's TGV trains apparently. Given its complexity reliability isn't as assured as in some cars, but enthusiastic specialists can usually find and solve issues for sensible money. With the original buyers taking a heavy hit on depreciation from new the C6 represents a used bargain for more adventurous motorists looking for something different. You cannot really afford to be choosy, given the number on sale. The 2.7 HDi V6 turbodiesel is the only engine you'll find in the classifieds, while Exclusive specification is the most common trim choice out there, too. The Citroen C6 is rare, unusual and achingly cool for the sort of committed buyer who's prepared to put up with a few potential reliability quirks for the individuality, comfort and equipment that the C6 brings. Not for the everyday buyer then, but for committed Francophiles it's a huge amount of car for the money.